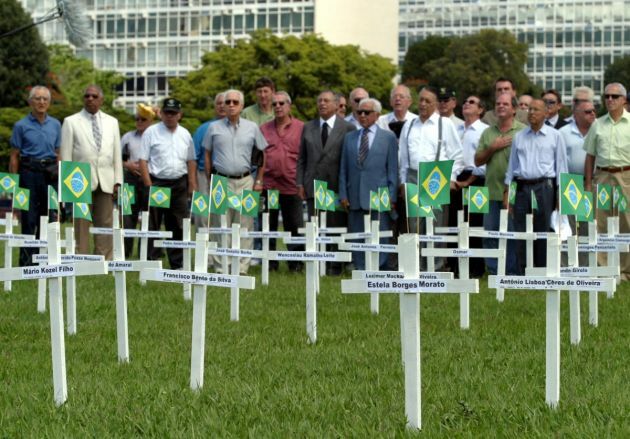 (Photo: REUTERS / Jamil Bittar RR / HB)Retired Brazilian Army officers stand near crosses they placed on the lawn in front of Congress in tribute to soldiers killed fighting leftist guerrillas and civilians killed in bomb attacks in Brazil between 1966 and 1974, in Brasilia, March 31, 2005. The tribute was held on the 41st anniversary of the military coup that brought into power the dictatorship that ruled the country from 1964-1984. Documents on human rights violations perpetrated by the former military dictatorship in Brazil, preserved with the help of the World Council of Churches, are now on a website launched in Sao Paulo. The site launched last week: Brasil: Nunca Mais Digital [Brazil: Never Again-digital], provides open access to more than 900,000 pages of official records of human rights abuses. (Photo: WCC)Sonia Wright, daughter of Rev. Jaime Wright was invited by the coordinators of the project to launch the website: Brasil: Nunca Mais Digital. 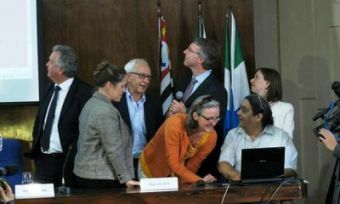 Brazilian human right activist Marlon Weichert expressed his thanks to the word council's former general secretary Rev. Philip Potter and a former WCC staff member, Rev. Charles Harper, for their support in originally gathering the evidence for the site. "The support of the World Council of Churches was crucial to this whole process," said Weichert. "We celebrate the creation of the website, but we also honour the victims and survivors and we reflect about the power of information and the truth." The new site was preceded by the similarly named Brasil: Nunca Mais (BNM) project, which was supported by the World Council of Churches in the 1980s. The files of documents and microfilms, dating to the days of Brazil's military dictatorship in the 1970s and 1980s, were until 2011 stored in archives of the WCC in Geneva, Switzerland and the Center of Research Libraries (CRL) in Chicago, United States. The files were secretly gathered from court records at the time and shipped to the WCC and the CRL for safe keeping. The current general secretary of the WCC, Rev. Olav Fykse Tveit, personally brought the files from the WCC Archives to Brazil in June 2011 and entrusted them to the Brazilian attorney general during a public ceremony. The restored court records are now available for public consultation on the website, Brasil: Nunca Mais Digital, named as a tribute to the 1985 book detailing State crimes perpetrated in the military rule era. The website was officially launched with a click by Sonia Wright, daughter of Rev. Jaime Wright, a Presbyterian minister in Brazil, who preserved the military government's records on torture along with American Brazilian pastor Charles R. Harper. The launch of the website marks a new period in Brazil's search for reconciliation after its tumultuous times before some 200 participants attending the August 9 event in Sao Paulo. Rosa Maria Cardoso da Cunha, coordinator of Brazil's truth commission, formed in June 2012, referred to BNM as a foundation to country's first truth commission and "what you did in the BNM established a parameter to our work." Weichert, a regional prosecutor, played a key role in the website project. He worked closely with the WCC and the CRL arranging repatriation of records, which include evidence that had gone missing from files held by the Supreme Military Court of Brazil. He also coordinated the teams that digitalized the documents and set the website. Speaking about the process of Brasil: Nunca Mais Digital, Weichert expressed his thanks to the WCC former general secretary Rev. Philip Potter and former WCC staff member, Rev. Charles Harper for their support in originally gathering the evidence. The 37th edition of the book Brasil: Nunca Mais is an important record of a time marked by the imprisonment of more than 50,000 Brazilians during the military rule. Marcelo Zelic, director of the organization called Amazém Memória, who worked closely with the regional attorney, emphasised the work of Charles Harper, who received the files in Geneva and catalogue them in the WCC archives. "Thanks to his careful work we now have the possibility to offer this information to serve as a more effective tool to over 170 criminal investigations that are already been undertaken," said Zelic. The formal transfer took place at the São Paulo Public Prosecution Office before government officials and church leaders, including two representatives of ecumenical organizations among those tortured by the military. "Brazilians can now know what went on while they lived under military rule. This is an important part of the truth process," Harper had told Presbyterian News Service in 2011. "The entire amount of documents is more than one million pages. "Those who were tortured are all now white-haired people like me. The Brazilian people have not had chance to know their full history.... These documents are of great pedagogical value," he recounted. The original Brasil: Nunca Mais project had the direct support of the WCC and the Archdiocese of São Paulo. Both were represented in the event. While addressing the public, Cardinal Dom Odilo Scherer, Archbishop of São Paulo, wondered what his predecessor Dom Paulo Evaristo Arns and Rev. Jaime Wright would have to say on this occasion. "I am sure they'd have a strong way to tell us: never more." WCC moderator, Rev. Walter Altmann, spoke about a few episodes the link of the WCC and ecumenical movement to the struggle for human rights in Brazil, Latin American and worldwide. "By building bridges for justice and peace across the world we say there is no oppressive regime that can suffocate hope and solidarity forever," said Altmann.